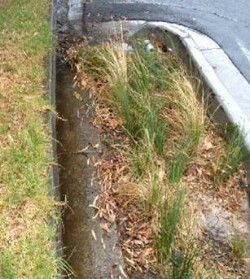 Bath Street, St Kilda - Example of a raingarden needing corrective maintenance works to rectify design and construction issues. The City of Phillip’s Water Plan (2010) sets out an integrated water cycle management plan to move towards becoming a water sensitive city. The plan establishes stormwater pollutant reductions targets, which the council addresses through the implementation of Water Sensitive Urban Design (WSUD) assets. However, the extent to which the targets are achieved depends upon these assets remaining functional and performing as designed. In order to ensure a 'whole-of-life' approach to WSUD asset management, which can deliver reliable long term pollutant reductions, the City of Port Phillip decided to take a more proactive approach. To help them along in this journey, they undertook a ‘Street Scale WSUD Review’ in partnership with the consultancy E2DesignLab. The aim of this review was to assess the condition of Council’s WSUD assets to identify maintenance and rectification needs, priorities and opportunities to improve future designs, procedures and capability. 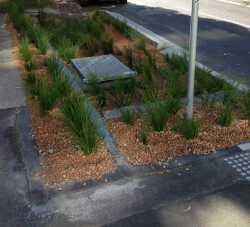 In August 2014, this project received the Stormwater Victoria Award in the Asset Management Category. To build internal Council capacity (in particular with Operations staff) around WSUD asset management. Comprehensive datasets: Asset information collected during this review and new asset collection protocols will enable improved integration of old and new WSUD assets into Council's asset management system, and ensure important information about WSUD assets remains readily accessible. Importantly, the information collected also provides a baseline dataset for all street scale WSUD assets, which will be very useful to measure improvements. Targeted maintenance guidelines: As a result of the review, the project team developed targeted maintenance guidelines (attached), which identifies two key areas of maintenance: (1) planned maintenance tasks and (2) corrective maintenance / rectification works. Planned maintenance tasks are generally predictable and can be undertaken within a planned timeline or framework of annual maintenance, whilst corrective maintenance tasks are recommended for assets where some of the key features need to be reconfigured to reinstate the function of the asset. When assets are designed, constructed and functioning appropriately, only planned maintenance should be required. Maintenance and renewal plan: A maintenance and renewal plan was developed based on the outcomes of the inspections. A framework for strategic prioritisation of works was developed based on consideration of issues such as the performance or functional impact of issues, amenity and profile of the asset, cost of works and safety. These were used to prioritise the maintenance works identified to form a schedule for the City’s ongoing maintenance efforts. Internal capacity building through the project delivery model and through tailored workshops. A Council staff member attended and participated in the inspections, gaining valuable insight not only into what to look for, but the thought process and functional understanding behind the consultant’s evaluations. In addition, a workshop was held with a broad audience of Council staff from different departments to disseminate knowledge and learnings to teams involved in the planning, design and delivery phases. The aim was to improve understanding of potential maintenance issues and what needs to be considered during earlier stages to minimise future Council maintenance costs or expensive rectification works. Capacity building of council’s primary maintenance provider through participation in a workshop, sharing their knowledge of the WSUD assets from observations and learning more about the function, things to look for and common issues. They also initiated development of a new ‘app’ to support identification of maintenance needs for use by their teams. Learnings around common design and construction issues were incorporated into the design of a set of streetscape raingardens under construction for Port Phillip as well as into the design of a new biofilter at Monash University. The project method has directly informed and benefited several similar projects. These include an asset assessment for another Council, and a review of asset management processes for two other Councils. Several outcomes of the review have now influenced and been incorporated into the revised Biofiltration Adoption Guidelines (FAWB and CRC for Water Sensitive Cities), which are used nationally. Finally, the learnings have been shared. The outcomes have been shared more widely with the industry conference presentations; locally at the Stormwater Victoria Conference (May 2014) and internationally at the 13th International Conference on Urban Drainage (ICUD) in Malaysia (September 2014). Improved communication and collaboration between council areas can be fostered through an inter-departmental workshop. This workshop brings people together who are responsible for different stages of the life cycle of WSUD: from planning and design through to maintenance. As an example, illustration of the maintenance issues that can arise helped those involved in early stages appreciate how important it is for the design to consider ease of maintenance and access as well as simplicity in construction, when it is seen how easily things can go wrong. It was also helpful for maintenance staff to gain a better appreciation of what the designers are trying to achieve and to open the door for greater communication through the various stages. Internal accountabilities and responsibilities can be refined indirectly by strong working collaborations across Council departments. During this project for example, internal accountabilities and responsibilities for WSUD maintenance were clarified through delineation of maintenance and corrective works. This enabled Council to better identify the works that should be undertaken within their maintenance contract, as opposed to works that should be undertaken as capital works to correct existing problems. There is also now potential for assets to be brought back to a functional standard through corrective works, so that the maintenance contractor can then take responsibility for maintaining the asset in an appropriate condition. Clear priorities add flexibility and responsiveness. An opportunity arose for some short rectification works to be undertaken. The shortlist of identified actions was used to identify a raingarden with poor performance and aesthetics and significant potential to be improved through relatively simple design and layout changes. Drawing on the recommendations and their own experience, council staff directed and supervised the maintenance contractor over two days. The raingarden was expanded to use the adjacent nature strip, providing greater treatment area, resolving a short-circuiting problem and creating a much more aesthetically pleasing system (refer to pictures for outcomes). Prioritise the assets to be inspected as much can be learned from looking at a representative range of assets and focussing on those that are most important. Problem definition. Recognise the importance of understanding causes as well as symptoms to correct existing issues and avoid re-occurrence. This may require analysis of historical information and design records or testing of elements like filter media to determine an appropriate rectification strategy. The cost of the project was approximately $30,000. This included auditing of over 100 individual assets (although many were tree pits) at 13 different sites, infiltration testing at selected sites and development of templates and targeted maintenance procedures. The project extended over approximately 6 months from mid 2013 to December 2013 including finalisation of the report and a follow up workshop for Council staff.